My nesting boxes just have the indentation for the eggs and babies, but no nesting materials in them. Should there be anything I am using in there for nesting material ? 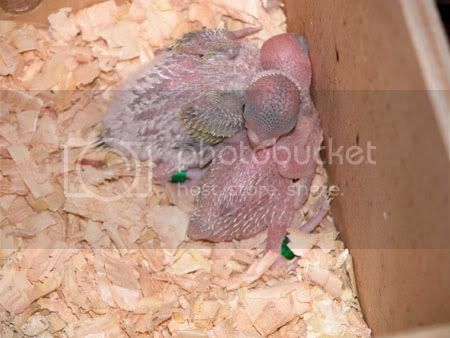 The box with the older babies gets very mucky and I am cleaning it out 3 times a day. Budgiebird I use wood shavings when I set up the bo. The hen will probibly throw most of it out. Thats fine. When the eggs hatch I put a bit more in and as the chicks grow add a bit more and more. I clean the shavings out regularly when they are soiled....every two to three days. It's best to leave it out in an open box so that it absorbs the humidity.. Nothing worst than dry shavings drawing the moisture out of the box and eggs or chicks..
Could you use pine shavings? If not, can you just use a cloth or would it just be better to leave the box empty? I would be worried with a cloth in case it got caught on mums claws as she was leave and could then break eggs or tumble little babies out of the box. Any wood shavings that is used for mice or rats that you find at a pet store is fine. Yes the mum will push it away but simply having it around will soak up some the droppings and make it easier to clean. Its just that I know your not suppost to use most shavings with rodents because there's a good chance it can cause respiratory problems, even shavings that are specaily made for rodents. So I was thinking it wouldn't be good to use with birds, as they are even more senitive to fumes and stuff. How about kleenex, or paper towel? Most pet stores and owners use these wooden shavings for bedding and floor covering in the animals housing. But are they safe? Can cedar or pine Shavings harm pets? Research is being done on how cedar and pine chips affect animals. The extracts from cedar and pine contain a number of volatile, (aromatic) compounds such as hydrocarbons, cedrene and cadrol. These are all known irritants of skin. They also have been known to cause irritation and death to cells in the respiratory tracks. This can lead to infection of the lungs. Increased rates of reparatory ailments have been connected to the long-term use of cedar and pine shavings. Symptoms may include: blinking of the eyes, coughing, sneezing, discharge from eyes and nose and breathing irregularities. Cedar and pine shavings have been known to cause problems in many different animals such as cats, dogs, rabbits, ferrets, rodents, snakes and lizards. Typically, the main reasons why people use the shavings are that they are cheap, easy to clean and control odors well. But, if it is possible that these shavings are making your pets sick, you may want to consider a safe alternative. I used to use shredded paper towels for my mice and hamsters. They also liked it because they could shred it too. You will need to provide bedding or litter for the animals in order to provide them with some warmth and insulation, set them at ease, and absorb waste. This has generally been in the form of wood shavings, usually cedar. This was very very wrong. Do not use cedar for bedding for rodents. It contains some very strong oils, which provide the cedar scent that masks the smell of the cage. However, these volatile oils can also irritate the skin and eyes of many rodents and possibly even cause permanent damage or death. Some people say the same thing about pine shavings, which also contain some volatile oils. The current RC (rodentially correct) litter is either aspen chips/shavings which have no such oils or a reprocessed paper litter, most often Care-Fresh. I have found the animals prefer the aspen chips. I have found that Care-Fresh seems to absorb odors better. There are actually two types of reprocessed paper litters, one is in the form of chips that most closely resemble wood chips or shavings, the other in the form of pellets, closely resembling rabbit pellets (the food, not the...) You want the chip type. There are also plenty of folks who still use pine--if you do use it, let it air out for a while, especially if you buy it in the compressed "bricks" rather than in a loose bag. I have heard reported, but never seen, negative reactions to pine among rats and gerbils. I have seen irritation among Duprasi (fat-tailed gerbils). I have seen others use paper towels and had no troubles with the chicks, but I don't like the idea of use that it turns to mush when wet which I think would be easy for a chick to chew on getting paper and droppings around and in the beak which can cause trouble. Where as the shavings clump around the droppings. Would kitty litter work? I think it is clay based ?? 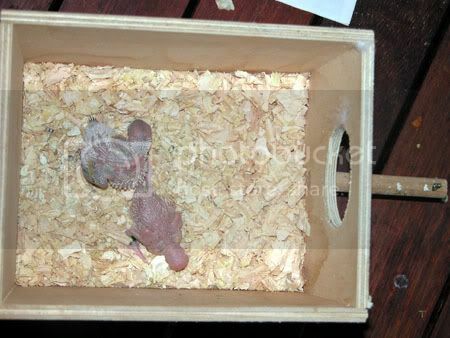 Well it's not recomened to use in the bottom of cages so i wouldn't think it would be good to use in a box. I have always used Wood Shavings, you can usually get a packet of Shavings at either a shop, Pet Store or your local produce you can get it in small packets (this is the usual size to use in cat litter trays) or large size used for horse stables. Depends on how many nest noxes you have. Yes my hens use to throw it out too but I always topped the nestbox up . I realised when Tootie started a small moult about five days before the egggs where due that it might be a normal thing beucase Freckle did the same thing. It would be funny to see other coloured feathers in there too. I didn't think of the moisture side of kitty litter I was thinking of babies eating bits of it ( the dust) and who knows what that would do to them. About the feather thing....all my mothers pulled out a small row of feathers from the breastbone area (vertically up their front ) when nesting. I thought it weird when the first one did then noticed they all did it. I was guessing it was to cover their eggs better with body heat but maybe now for nesting material too ? I have just been told by a very experienced bird breeder of a product he uses as nesting material that works really well. It comes in a dry compressed brick shape....it is coconut fibre / peat and generally used for a mulch type situation in plant pots. You get the fibre "brick" , put it in a very large bucket and add water. It takes up the moisture and swells. When that is done you squeeze out all the extra moisture you can and loosely line a nesting box with it. It does not take moisture out of any eggs, and is virus free as well. He has had much success with it for all types of birds over some years. In particular conyer parrots, bourkes, scarlets, cockatiels, finches and budgies. Open to suggestions and debate by all but the right thing by this breeder who I would class as genuine and knowledgable. I do not suggest this during the egg laying process. By the time the egg is due to hatch it requires a certain percentage of moisture to be removed from the egg. THe hen constantly adjusts the humidity in the nest to allow for this. If you are going to use moist nesting material you could end up with many dead in shell chicks. 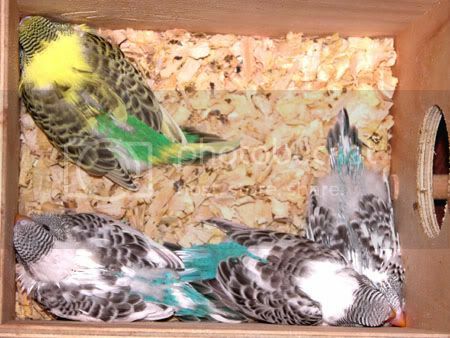 This breeder must be experienced enought to know what he is doing.